This page is a translated version of the page Conklin and the translation is 100% complete. 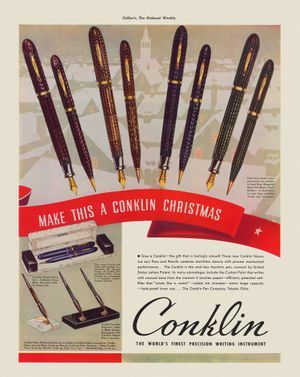 Conklin was officially founded in 1898, but its founder, Roy Conklin, had been in the fountain pen business since 1891. The success of the company was mainly due to the invention of the Crescent Filler, the first really functional automatic filling mechanism. But after its initial period the company underwent a gradual decline, completely ceasing production around the 1948. The brand was recreated in 2000 with the production of pens that reflect the design of the old models. The Conklin had the maximum of its success at the beginning of the '900, when it became the market leader thanks to the Crescent Filler, but was not able to keep up with competitors in subsequent innovations, and although in the subsequent years it produced pens of undoubted value and excellent quality, still much sought by collectors, success the company was no longer been able to innovate, gradually losing market share and remaining constantly behind the Big Four. 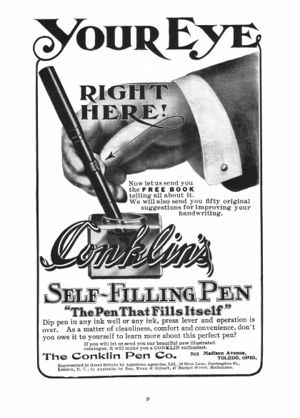 The Conklin Pen Manufacturing Co. was officially born with this name in Toledo, Ohio, in 1901, but the company was founded by Roy Conklin as Self-Filling Fountain Pen Company in 1898 together with C. B. Gundy. The previous year Roy Conklin had registered the patent for the first working automatic filling system created for a pen. The company strong initial success was due to the creation of the Crescent Filler, which was the first automatic filling mechanism truly reliable. These firsts models were made in chased hard rubber like other pens of the same period, but their innovative filling system led the company at the top of the market. In 1904, Roy Conklin withdrew from company selling all its shares, after that the ownership passed hands several times. In this golden period Conklin followed a policy of trade expansion, with vigorous promotional campaigns, exporting even in Europe and South America. In 1916 Conklin introduced an innovative spring clip, that can be open very easily; for its simplicity and elegance the same mechanism has been used today by modern companies like Visconti, the only patent found about it (nº US-1267575) was applied in 1917. 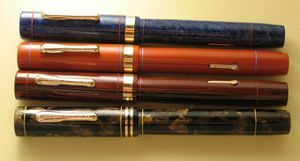 The sales of fountain pens, although declining, remained at the top of the market, also if Conklin models become to be considered a little dated. In fact, although functional and efficient, the Crescent Filler had its worst flaw in being unpleasant from an aesthetic point of view, and despite a strong promotional campaign that emphasized its merits (Mark Twain, taken as testimonial, endorsed the advantage of it not allowing the pen to roll down from the table) with the appearance of lever filler pens the sales began to decline increasingly, despite that the new mechanism was inferior from a purely technical point of view. This is why in 1921 also Conklin started producing models with a peculiar lever filler mechanism, ingeniously constructed so that only half of the lever was in the open. With the introduction of the large dimension pens trend started by the Duofold also Conklin introduced in 1923 the Duragraph model. The following year the Duragraph was renamed as Endura and the production was converted to celluloid. Initial model were in black or red hard rubber, but soon they were produced in celluloid, with different colors like Rosewood, Black & Gold, Lime Green, Lapis blue and the rare Blue & Gold present only on smaller models. 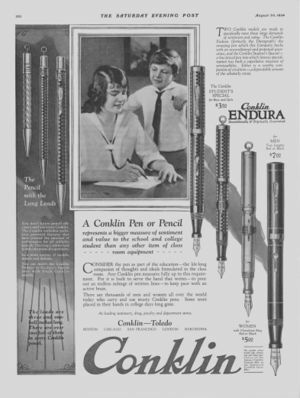 The Endura was the top model of Conklin, with the name put on the nib and the body, produced in three version, a short vest pocket, a standard and senior senior size. In the same time were also produced an economic model for students, that so collector are calling Student (but mentioned in and advertisement as "Three Fifty" by their price in dollars, $3.50), with the same shape and dimension of the Endura standard model, also produced in pastel colors. An Endura AD's of 1924. At that time however the company was no longer a market leader, but was merely following trends set by the others companies. An example of this is the introduction in 1929 (or in 1930), of its streamlined model, the Symetrik, following the new trend launched by the Sheaffer Balance. The sales were in constant decline and the company suffered heavily from the effects of the great recession of '29. Around 1930 Conklin started an economy line named All-American. The last Conklin important model was the Nozac, designed by Louis Vavrik and introduced in 1931. Nozac is the only American pen equipped with a piston filler; it had a transparent tank with large ink capacity (further highlighted, since 1934, by the word gauge, a scale that measured the number of words remaining). The pen, produced in beautiful color and with a multifaceted body, is one of the best model of that time, but the mechanism, derived from that one of a mechanical pencil, was not particularly robust and efficient and the pen did not have the success that it would have deserved. In 1937 a plunger filler version of Nozac, called One Stroke, was produced. A Nozac advertising from 1937. The company was still declining and in 1938 all the Conklin assets were transferred to the investor group Chicago Interests. The following year Toledo plants were closed and the production was moved to Chicago. The previous models remained in production during the war but few pens were produced. In the following years the production continued to move towards the low end of the market with economic fountain pens to and a low cost ballpoint. Although some of these models, like the Glider, have some collectors interest, the Conklin production progressively reduced in quality and quantity, to completely cease in 1948 (or 1955?). Today, as it happened for many other historical brands, Conklin was rebuild in 2000 and operates now as Conklin Pen Co. Inc. Its pens are essentially some replica of the successful models of the brand golden years, but as it happens for most of the modern pens, they have no particular qualities that can distinguish them from other pens, especially when compared with their beautiful ancestor. ↑ for this event Jim Mamoulides reports in this page around 1907, while Michael Fultz says 1904, citing J. F. Vogel as new president, J. H. Doyle as vice president and H. E. Fisher as secretary/treasurer, so we decided to use his date for citing also a lot more details. ↑ different source reports both dates. This page was last edited on 16 December 2018, at 19:25.